BREAKING RELATED UPDATES An invasion of the port of Hodeidah is underway, with some intelligence assistance from the United States. (New York Times, June 13; Wall Street Journal, June 12.) Ten Senators, including the chair and ranking members of the Senate Foreign Relations Committee, have expressed "grave alarm" and reiterated that there is no military solution (see June 12 press release). Thirty-four Congressmembers have also raised alarms (June 12 letter and June 13 press release). See also assessment/statements from Scott Paul of Oxfam (June 11) and Kate Kizer of Win Without War on June 12 (both Forum-listed experts). According to media reports and other sources, the Trump administration is planning to notify Congress of significant precision-guided munition sales to Saudi Arabia and the United Arab Emirates. As of late June, these direct commercial sales had yet to be formally notified, but are under informal review. On June 28, Senator Robert Menendez (D-NJ), the ranking member of the Senate Foreign Relations Committee said he cannot support moving forward with a formal notification. 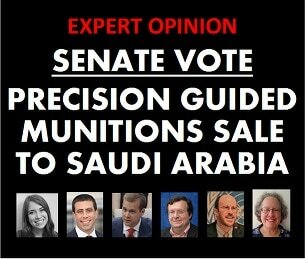 In June 2017, 47 Senators voted to block the sale of roughly $500 million in precision-guided munitions to Saudi Arabia, narrowly failing to win a majority. 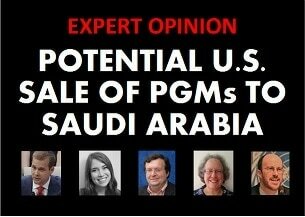 Forum-listed experts* to contact on this subject include Kate Kizer, Kate Gould, William Hartung, Jeff Abramson, Rachel Stohl, Stephen Miles, Andrew Feinstein (global perspective), and emerging expert Caroline Dorminey. “Congress Must Stop UAE, Saudi-led Military Offensive in Yemen,” Kate Kizer, Win Without War, Statement, June 12, 2018. “If the US fails to stop the Hudaydah attack, it will own the consequences,” Scott Paul, Politics of Poverty, Oxfam, June 11, 2018. "With New U.S. Arms Sale Pending- What Happened to Saudi Assurances on Civilians Casualties in Yemen?" Isa Qasim, Just Security, May 24, 2018. Oona Hathaway +, "State Responsibility for U.S. Support of the Saudi-led Coalition in Yemen," Just Security, April 25, 2018. "Arms Sales To Saudi-Led Coalition Demand Scrutiny" Eric Eikenberry and William Hartung, Inkstick Media, April 9, 2018. "Developments in Hudaydah," Mike Pompeo, Press Statement, June 11, 2018. 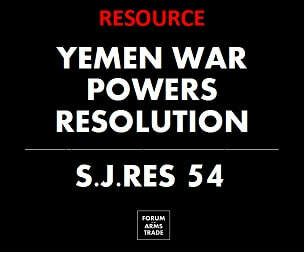 Insights on UN Security Council actions: “Yemen Consultations,” What’s In Blue, June 11, 2018. 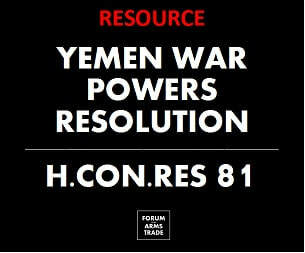 "Key US Democrat holds back support for Gulf munitions sales over Yemen," Joe Gould, DefensesNews, July 3, 2018. “Why the West is no honest broker in the world's worst humanitarian crisis,” Margaret Evans, CBC News, June 22, 2018. "U.S. Dubious About U.A.E. Appeal for Military Help in Port Fight," Dion Nissenbaum, Wall Street Journal, June 8, 2018. "The world's worst humanitarian crisis could get even worse," Washington Post editorial post, May 28, 2018. "U.S. Backing for Saudi War in Yemen Draws Congressional Concern," Dion Nissenbaum, Wall Street Journal, May 23, 2018. "Congress reviewing sale of precision munitions to Saudis, UAE: sources," Mike Stone and Patricia Zengerle, Reuters, May 22, 2018. "U.S. Moves Forward With Multi-Billion Dollar 'Smart Bomb' Sale to Saudi Arabia and UAE Despite Civilian Deaths in Yemen," Alex Emmons Intercept, May 12, 2018. "Army Special Forces Secretly Help Saudis Combat Threat From Yemen Rebels," Helene Cooper, Thomas Gibbons-Neff and Eric Schmitt, New York Times, May 3, 2018. * Inclusion on the Forum on the Arms Trade expert list does not indicate agreement with or endorsement of the opinions of others. 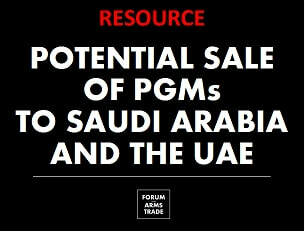 See overview resource page tracking Trump's initial 2017 announcement of $110 billion in arms sales to Saudi Arabia and subsequent developments. In 2018, 44 Senators voted to support an effort to end US involvement in the Saudi-supported civil war in Yemen via the War Powers Resolution. In 2017, a similar resolution was introduced in the House. See resources below. Forum-listed experts commentary from June 13, 2017, and recap of the Senate vote on SJ Res. 42. Forum-listed experts commentary from March 2017, and recap of opposition into late May 2017. 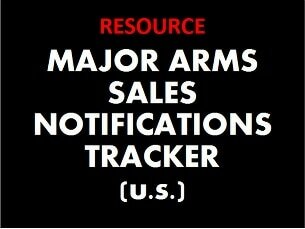 Features resources on other 2017 US-Saudi arms notifications and also looks beyond just the United States, including comments by experts in February 2016. Expert commentary on and description of Congressional opposition in August and September 2016 on $1.15 billion battle tank sale. 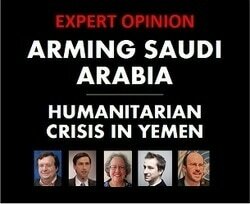 Crisis in Yemen: Humanitarian and Security Consequences of Military Support to the Region. See archive.